This image is perfect for pinning on your travel/vacation board on Pinterest. 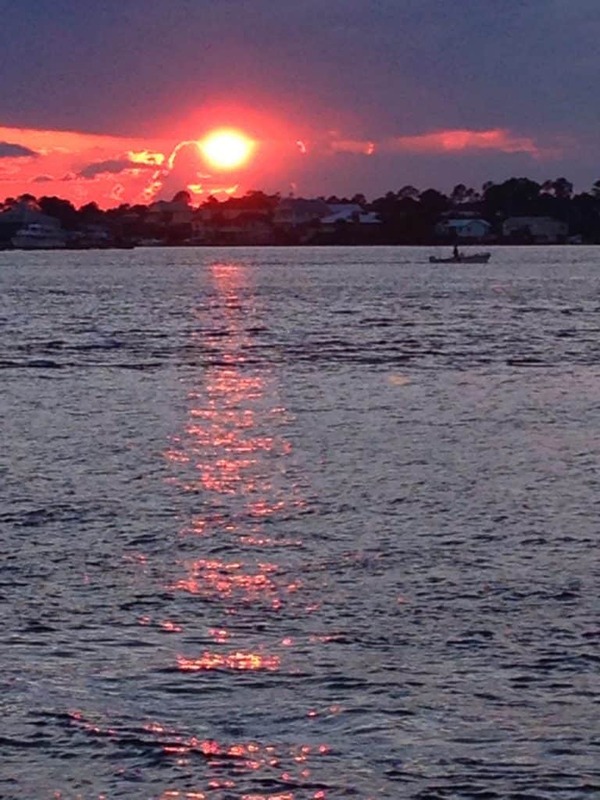 If you’re considering a beach vacation, or a Gulf Shores Girlfriend Getaway (like the one I had) to the beaches of the Gulf Shores/Orange Beach area, in Alabama, I bet one of the top questions on your mind is, “But what is there to DO in Gulf Shores? Is there anything fun to do down there, other than to go to the beach?” My answer for you, after my Girlfriend Getaway , would be a resounding, “Yes! There’s SO much to do!” And each of the excursions I went on was unique! Some are more active, and some are more laid back. So, basically, there’s something for everyone. 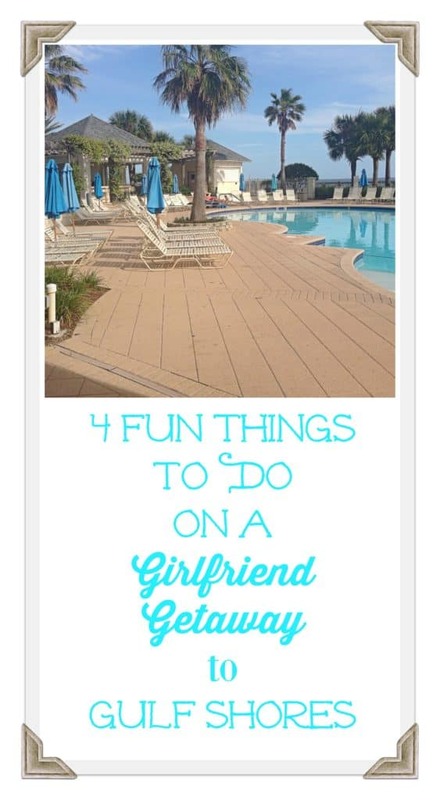 In my last post, I told you about the 4 Top Must-Haves for a Girlfriend Getaway/Road Trip. 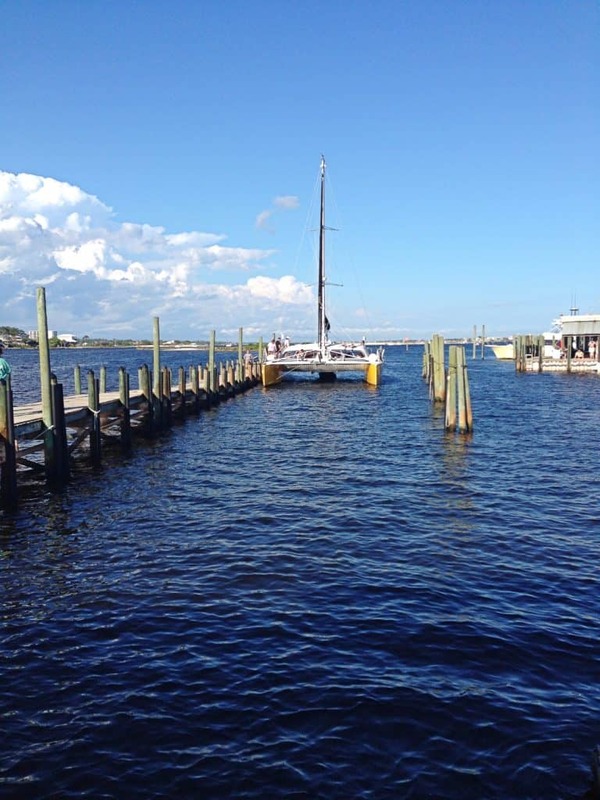 The fourth of the 4 Must-Haves was a great destination, and after my OWN Girlfriend Getaway to the beautiful beaches of Alabama, courtesy of Gulf Shores and Orange Beach Tourism, I can say that without doubt, the Gulf Shores and Orange Beach area is a great locale for a girlfriend getaway. 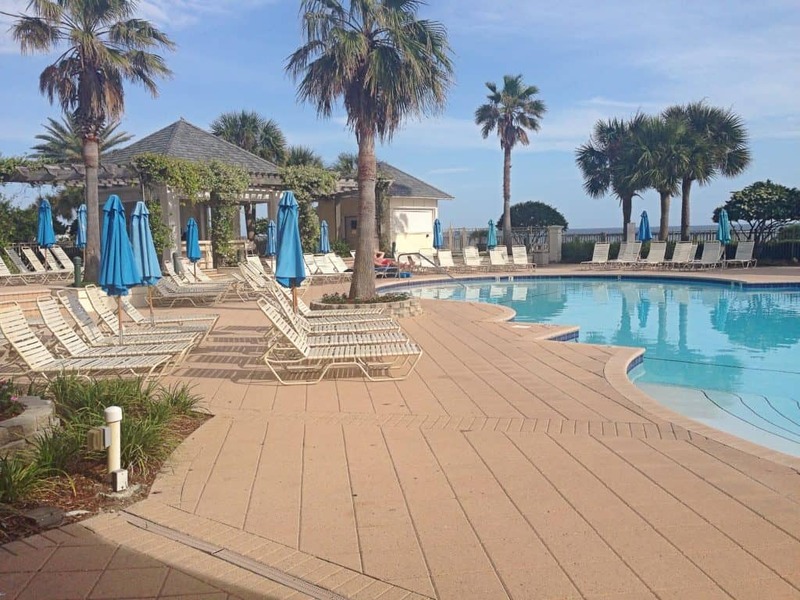 You really should go check out that earlier post to see the BEAUTIFUL condo we stayed in, via Gulf Shores Rentals. They have that property, but of course, they also have so many other options, and one of them might be just the ticket to meet YOUR group’s needs. Beach yoga was challenging and rewarding. I loved it! I thought I’d tell you about the 4 Activities I did in order of the time of day we did them. The one scheduled earliest in the morning, (and the one I was dreading the most, to be perfectly honest) was Beach Yoga. I’d never done a yoga class before, although I’d once purchased a CD to do yoga at home, and just hadn’t had any success with it. In fact, each time I tried using my yoga CD, I ended up hurting my back. So I was kind of dreading potentially hurting my back through this class, and then having to endure a long, painful ride home. But that didn’t even come close to happening. The first thing that happened that ensured my success was having a great live instructor, who was there to make sure I had an enjoyable workout, and to give me helpful feedback, like, “Relax your shoulders” when she saw them climbing up toward my ears. I can almost guarantee you that that made all the difference. Jennifer from Glow Yoga was so affirming, and accepting. She underlined the importance of accepting the resistance that my body was offering me in that moment. Of just allowing it to be what it was. And when we did the tree pose? So what if my tree was a little wobbly that day? Let it be. Accept where my body was in that moment. I can’t tell you what a difference a little personalized encouragement for me in that moment made! And as we began our cool down, the joy of not only haven given my body a challenge, but also of hearing the waves, and feeling the wind on my face and in my hair was so soothing. She encouraged us to close our eyes, and listen to our breathing, and to the sound of the waves. And while I was doing so, she silently slipped up behind me, and gently rubbed my temples, and smoothed my forehead. And as I, in surprise, opened my eyes, I saw her smiling face above me, wreathed in a white glow from the overhead clouds. In that moment, I felt so loved and accepted. And all of the sudden, I had the thought that this is how the Father in Heaven feels about each of His children. That He looks down on us in our weakness, and our struggles and trials, and smiles at us in love, as He tenderly regards us. It was a deeply spiritual moment for me. I shared it with Jennifer, after the class, and her response to me was, “Oh, good. I almost shared something like that at the beginning of the class, but I didn’t. But now, I see I didn’t need to. That message came through anyway, without words.” It still chokes me up, thinking about it. I can’t guarantee you that you will have a deeply spiritual experience yourself if you do Glow Beach Yoga class, but I can tell you that if you’re open to it, you just might! 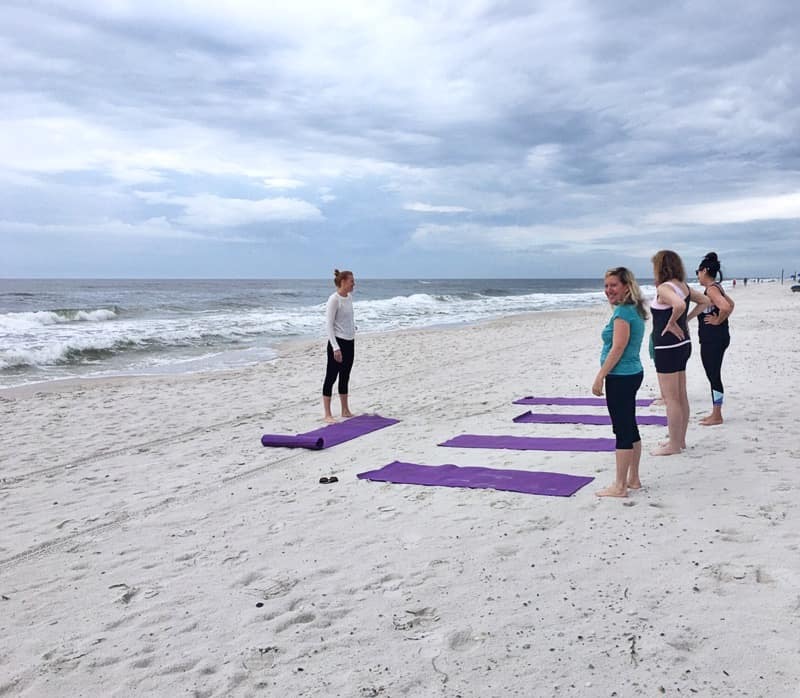 Beach yoga is a beautiful experience, that I can highly recommend. Another morning activity for us was our 2-person kayak excursion with Wild Native Tours. 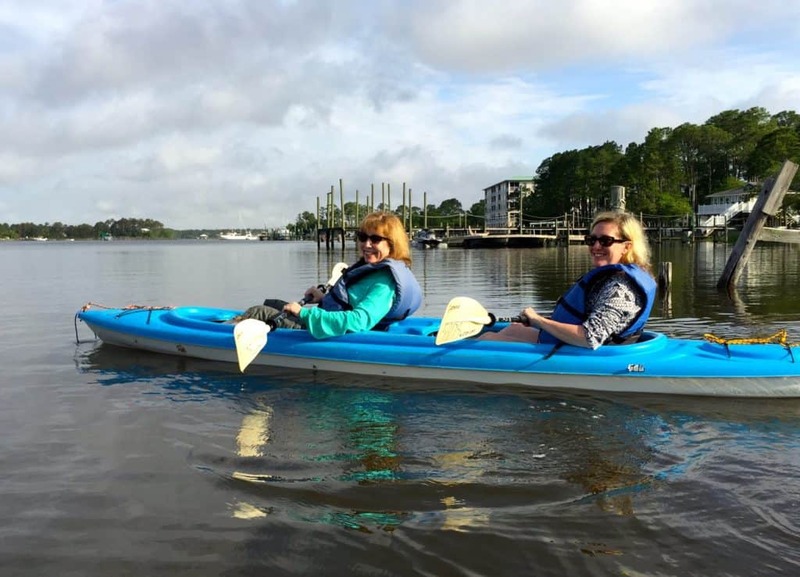 We took an hour and a half trip – the one they call the ECO Kayak tour – of the Bon Secour Wildlife Refuge. I was kayak-mate with Jamie, and even though we were the weakest paddlers of the group, we still had a great time! It was a good upper body workout, and we got to see dolphins going after their breakfast! 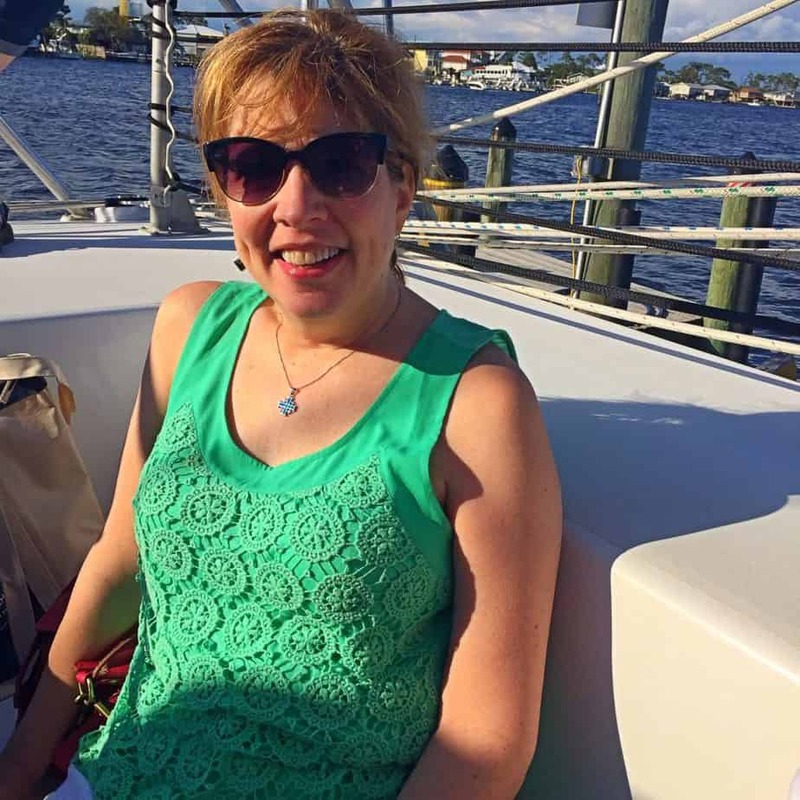 It was also kind of exciting paddling across the Intracoastal Canal – kind of like crossing a busy street – on our way to the wildlife refuge, where we saw tall grasses on either side, and dolphins playing in the gentle waves, having their breakfast. One thing I learned to watch for were birds: where you see birds over the waters, there are likely fish. And where there are fish, it’s likely you’ll find dolphins feeding nearby. No pictures of me getting a massage, thank God! While two of us were getting our massages done, the other two of us had time to relax in the hot tub/waiting room. That was where Desiree and I had time to connect. I’m telling you, when you’ve just had a massage, and are thoroughly relaxed, there’s no better time to talk about what’s on your heart. The old saying among masseurs is that “there are issues in the tissues”, and when your tissues have become relaxed, well, your heart is softened, too. And isn’t that one of the most important points about a Girlfriend Getaway? That you have time, and space, to actually share your heart with another woman? Guys are great, but there is just nothing like having a listening, understanding, caring female friend to spill your guts to! 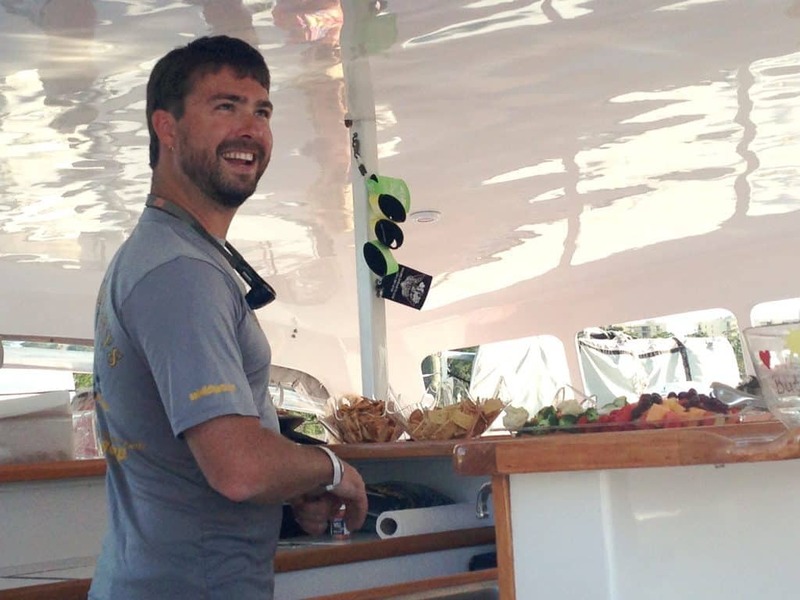 A 53 foot catamaran is a big boat, y’all! 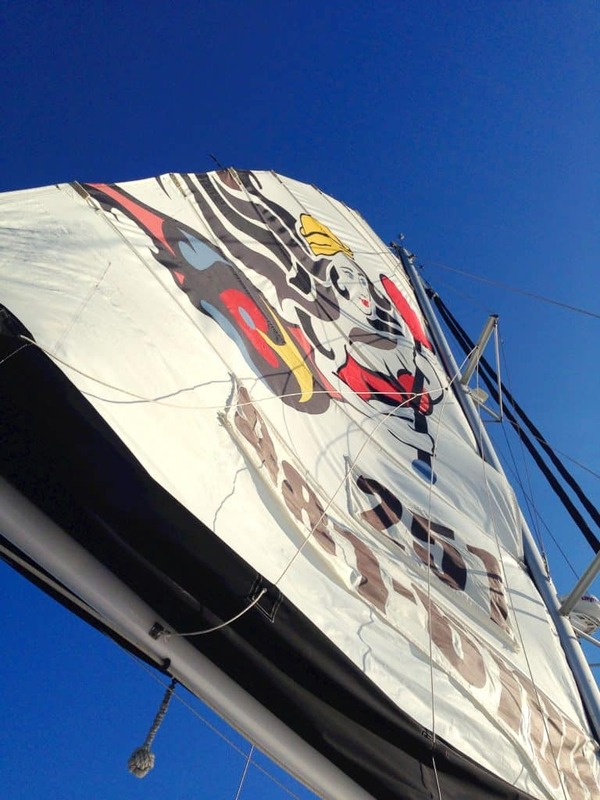 Finally, the evening activity that is all “Relax – and leave the sailing to us”, was our WONDERFUL sunset cruise aboard a 53 foot open ocean catamaran, courtesy of Wild Hearts and Captain Zach. I sat on the front of the boat (is that the bow?) and enjoyed the wind in my face, and absolutely perfect playlist chosen by Captain Zach’s wife. (Who had had a baby that DAY! What was Captain Zach doing showing us a good time??? I guess somebody has pay for the Pampers.) Wild Hearts offered hors d’oeuvres, as well, although I just enjoyed a bottle of water, and the sunset. Although it’s hard to choose a favorite activity, this is definitely near the top of the list! 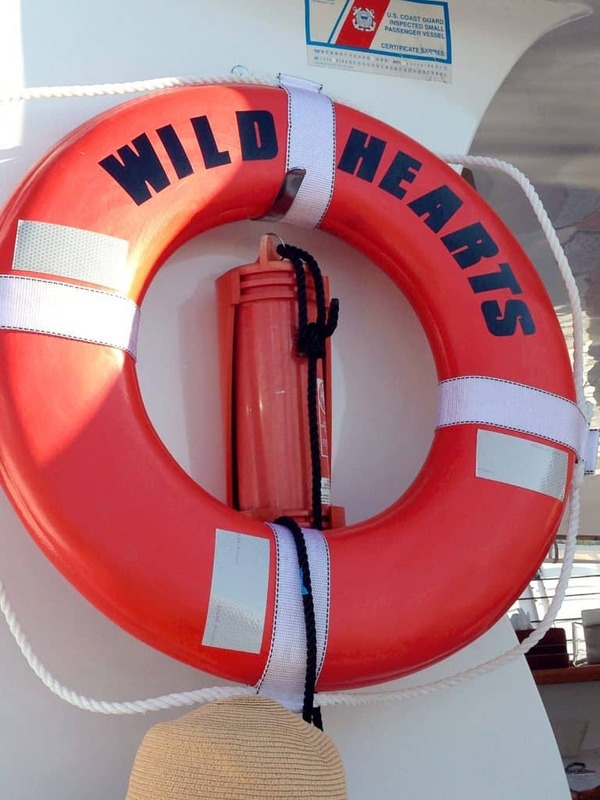 On board the Wild Heart. Photo taken by Angela Roberts. Captain Zach, the new daddy, is a great guy! And notice the lovely spread of hors d’oeuvres they put out. The actual sunset we saw on the Sunset Cruise of the Wild Hearts. So don’t hesitate to choose the Gulf Shores/Orange Beach area of the beaches of Alabama, if you’re looking for a beautiful Gulf vacation. There are PLENTY of great things to see, and do! In my next post, I’ll be sharing about some of the great places there are to eat there, so stay tuned!